Dehumidification Function - Control your indoor humidity level with our innovative dehumidification function. 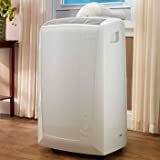 It mixes cool dry air, with the warm air to keep you comfortable and prevent over-cooling. It can even save you money. 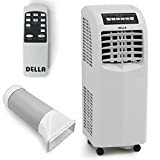 The DeLonghi 45-pint dehumidifier with patented pump features a worry-free pump function that allows the unit to continuously discharge moisture without constantly emptying a bucket. The unit can pump water upward to drain out a basement window or into a sink, up to 16 feet with the provided hose. The electronic controls and LCD display allow you to adjust relative humidity, monitor room temperature and set the 24-hour timer. With its frontally located tank and transparent water level window, you can easily see how much water has been collected if you choose to use the tank function. The tank has a 6-liter capacity and an alarm alerts you when it is filled. 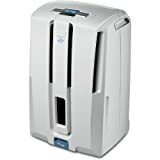 The DeLonghi 50-pint dehumidifier with patented pump features a worry-free pump function that allows the unit to continuously discharge moisture without constantly emptying a bucket. The unit can pump water upward to drain out a basement window or into a sink, up to 16 feet with the provided hose. The electronic controls and LCD display allow you to adjust relative humidity, monitor room temperature and set the 24-hour timer. With its frontally located tank and transparent water level window, you can easily see how much water has been collected if you choose to use the tank function. The tank has a 6-liter capacity and an alarm alerts you when it is filled. In contrast to yesteryear's compressor-based dehumidifiers, our DehumMini uses advanced Peltier technology. Ever heard of it? Probably not, as it is whisper quiet. But quiet operation is just one of the many benefits of using this technology. It also allowed us to squeeze such a powerful and effective dehumidifying system into such a small package. Even more, it needs no moving parts to function, and that results in a lightweight machine sporting a longer lifespan. 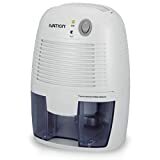 Using the Ivation DehumMini dehumidifier is easier than frying an egg. Simply check that the removable water-collection reservoir is clicked in securely, and stick it in any area that can use a bit of a dry spell. How well does the thing work? Well, its smaller size makes it suited for spaces up to 1,100 cubic feet, so that rules out using it in that giant outdoor pool you've got. But it works amazingly well for small laundry rooms, basements, attics, and even RVs, boats and antique cars. At the end of a day of 86° Fahrenheit and 80% relative humidity, expect to find approximately 8 ounces of water in the water tank. To spare you the hustle of emptying out an overflowing water tank every day, it can hold approximately 16 ounces or 2-days' worth of dehumidifying action. Now no Ivation product is complete without some form of flashing light. We therefore programmed our dehumidifier to shut off automatically once it has reached capacity, and to light up an indicator LED to remind you to empty the tank out. A 9v DC power adapter is included, and power consumption peaks at 22.5, making this an efficient and reliable unit with the comfortable dimensions of 5.75" x 5.32" x 8.78". 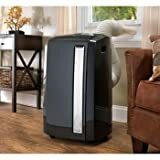 The North Storm 4-in-1 Portable AC Unit brings compact versatility to your home or office. No need to have multiple units that take up space when you can have one that does everything! Cool up to 700 square feet. The combined heater, dehumidifier and fan means you can make use of this during all season and save money and space on addtional units. The built in wheels make this easy to move from room to room and the remote allows you to control it with ease. Digital display shows you all the information you need to see. The included window kit allows you to use this on a variety of windows. Make the most of the space in your house with this 4-In-1 standalone unit. 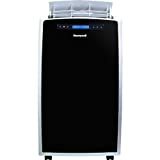 Heater, air conditioner, fan and dehumidifier for true mulit season functionality.